MedClarity, by Medusind, is a cloud-based platform that helps medical practices of all sizes to store patient information, send claims, and generate reports. MedClarity provides an intuitive navigation interface that allows medical practices to manage workflows and control day-to-day operations with multi-tabbed browsing functionality. MedClarity offers a scheduling tool that enables front-desk operators and administrators to color code the status of appointments for quick viewing and analysis. The appointments are also tagged with eligibility statuses and co-pay indicators to assist patients with insurance information. Practitioners can view the medical summary of every patient including name, date of birth, location, insurance balance, and amount payable. MedClarity also allows users to edit, cancel, or reschedule existing appointments. MedClarity offers a rule-based engine for real-time eligibility verification and smooth processing of insurance claim submissions. It also streamlines denial management and charge entry processes to ensure that all the claims are submitted correctly and approved in minimal time. The platform sends real-time error alerts to all the relevant stakeholders to notify them about any costly errors in their application. MedClarity offers reporting and business analytics features that provide insights into revenue cycle operations and allows business executives to spot trends. It also generates and saves reports that provide analysis by carrier, procedure, location, and provider. Other features offered by the solution include batch processing, report filtering, task bar, and action items. 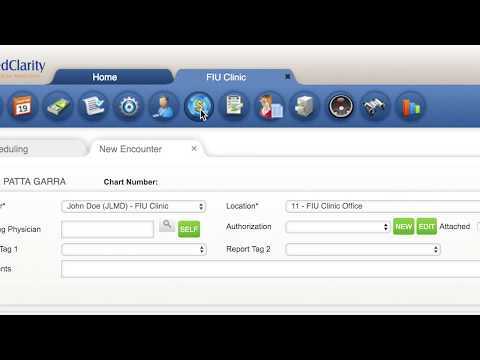 MedClarity also integrates with multiple EMR platforms. My practice has been using Medusind for practice management technology and medical RCM services. The past two years have been fruitful and I feel as though we are getting a solid return for Medusind's fees. We have greater accountability for billing and AR and are able to track all patient visits/surgeries/procedures through their Med Clarity system. The Med Clarity system is easy to use and gives me all of the information necessary to run my practice. My accountant routinely mentions the ease of use from a finance reporting perspective. Before partnering with Medusind we had consistent cash flow problems and issues with patient scheduling. After two years the state of my practice has improved tremendously, and we are able to track patients in all 5 locations. As a whole I am very satisfied with the technology and services I am getting from Medusind.The Med Clarity system is very intuitive and producing reports is a breeze. The ability to track my cash flow and patient insurance balances is key. The Med Clarity system helps me understand the operating basis of my practice real time. It has enabled us to notice trends in billing and payments with multiple insurance companies which has allowed us to collect our money faster. I highly recommend MedClarity. MedClarity is user friendly with a built in 'help' button that takes you to the online manual, if you need it. Teaching new employees to use it is a breeze. You are able to set up your own schedules, blocked times, appointment types, cancellation reasons and more. The reporting function is top notch. You can pull a report for ANYTHING you want to know, from one payer to all, from one physician to all and for any dates that you want. The system overall is very user friendly, but the analytics and reporting tools in MedClarity are by far one of the best features. It has helped our practice identify payer trends among physicians and locations, pinpoint denials and how to prevent them and uncovered improvement opportunities in our front office. The reporting and analytics features are amazing. We receive a monthly Wellness report directly from the system that tells us how we are doing in all areas without us having to spend hours to prepare reports. Contact Medusind for pricing details. •	MedClarity practice management solution can meet the requirements of a single location center as well as that of complex practices operating multiple units at separate locations. •	The tool enables healthcare organizations to create, save or export monthly practice wellness reports in PDF or Excel formats and helps executives analyze complex information to derive meaningful insights. •	The solution offers a customizable interface that lets users view only those functions on the main screen that they plan to use frequently. •	MedClarity allows users to view and drill down information on revenue operations by using business analytics tools available within the interface. •	The tool offers a reimbursement management screen that acts as a communication tool between medical practices and collectors to handle issues such as inaccurate demographic data and patient age. Below are some frequently asked questions for MedClarity. Q. What type of pricing plans does MedClarity offer? Q. Who are the typical users of MedClarity? Q. What languages does MedClarity support? Q. Does MedClarity support mobile devices? Q. Does MedClarity offer an API? No, MedClarity does not have an API available. Q. What other apps does MedClarity integrate with? Q. What level of support does MedClarity offer?